I love this time of year. I love all our holiday traditions, decorating, baking cookies, and spending time with family. Saturday night after my tree was all decorated and standing there looking so pretty I see a set of lights start flickering...and then there goes the whole tree...Two hours later we figured out the problem (one set of lights was bad along the string and knocked the surge out). 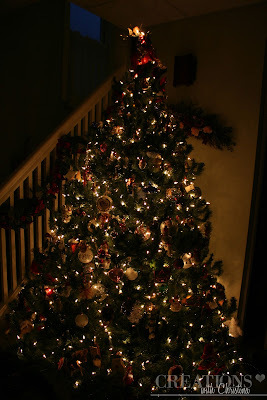 We had to undecorated sections of the tree and put new sets of lights on and re-decorated the tree. Thank goodness I didn't have to take all the ornaments off and re-do the whole tree. Here is Taylor, I was worried our kittens would be a little too happy about the new big toy we installed, but they seem to be leaving it alone...Thank you! I'm heading out early today to do some shopping. Have a great day everyone. Everything looks so pretty!! 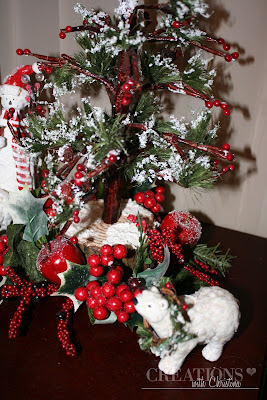 DH commented on FB that it's not even 12/1 yet and the tree is up, inside and outside is decorated, and I need help! lol Guess he doesn't get it!! TFS your house!! Wow so pretty! the funny thing is i think our cats are twins and i'm pretty sure i have that exact same picture of Lily under the tree.!! Your house and tree look so pretty! Love it! Lovely decorations! My cats love to sleep under the tree too. But our little one climbed it, several times, the first year! Luckily nothing got broken. Pretty Tree and home. Happy Holidays! Your tree and house are beautiful. We would have had ours done but this past Sunday when we planned to decorate it rained cats and dogs. We had to change our plans and will do it this next Sunday. Oh well, it will get done. 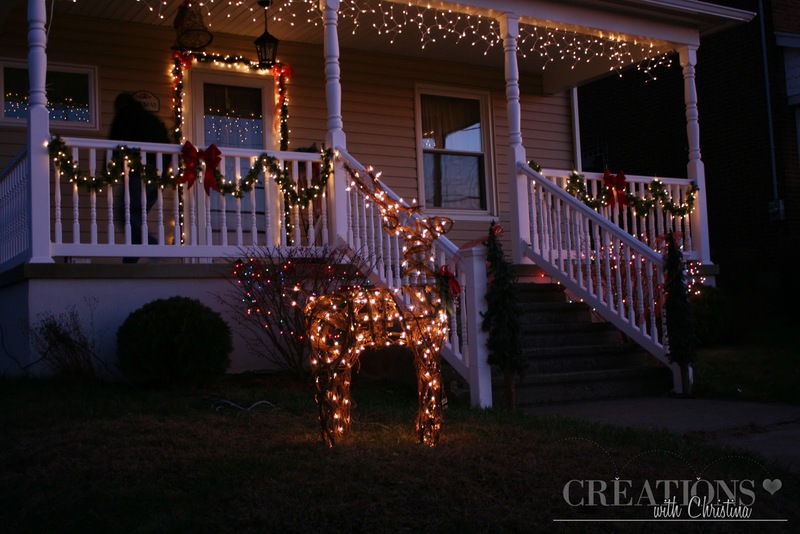 Thanks for sharing the pictures of your beautiful Christmas decorations! 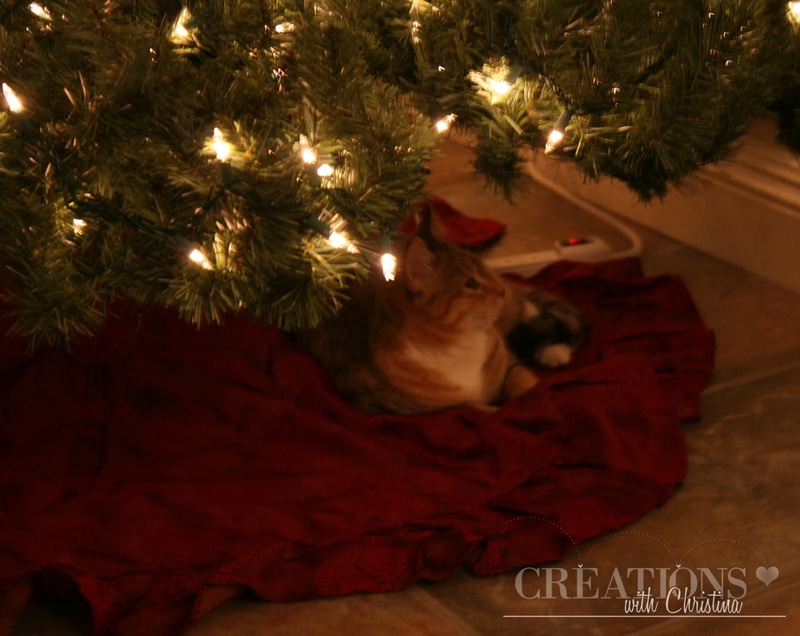 I'm not a cat person, but, the pic of your kitten laying under the tree is really precious!! Beautiful......looks like you are all set for Christmas. Really pretty decorations. Love the cat pic. Your little polar bear is so cute. Christina everything looks so festive! this will be my first year of not decorating for Christmas. We are going to FL for a week over the holidays to spend with my grandkids, so no one but my hubby and I would see the decorations, so we are going to be lazy. Thanks for sharing! Oh your Christmas decorations are so beautiful and I'm sorry about the lights on your tree..glad you got it worked out..I would have been so upset with something like that happening. 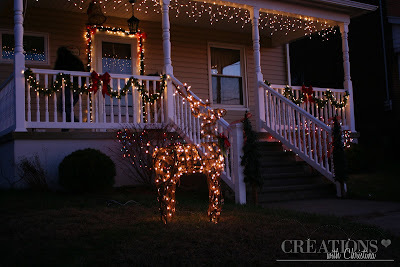 The picture of your house outside lights is so old fashioned and reminds me of many Christmas's past. It is so old fashioned looking I just love it..